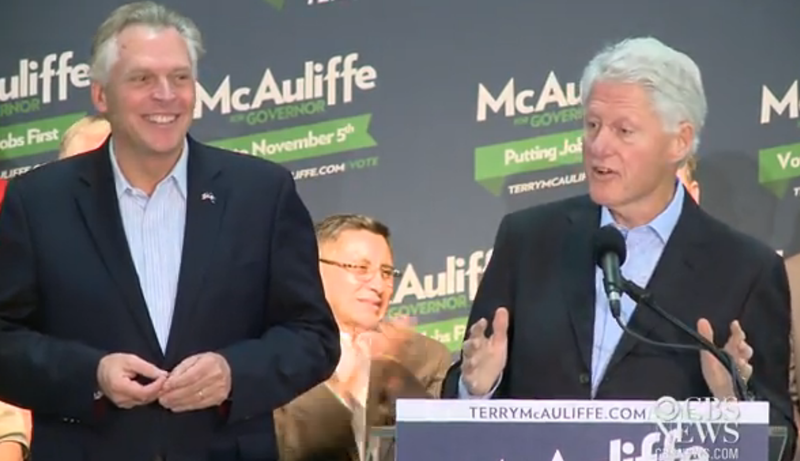 In this image below, captured during the 3:54 - 4:03 segment in the above video, Bill Clinton is shown campaigning for Terry McAuliffe - who is running for Governor of the Commonwealth of Virginia. Here we see an example of two different hand nonverbals - one is advisable while the other is not. Note: The original video has, since the original post, been removed from its online source. The image below however, wascaptured from this video. Bill Clinton is exampling a "Basketball" steeple. In a simplistic way of thinking, the basketball steeple is a "watered down" version of a "conventional steeple". However, while basketball steeple is certainly less alpha - it also has the effect of building rapport, conveying confidence and assertiveness - without being hyper-alpha as would be projected an extended conventional steeple. Conventional steeples should be used very briefly - otherwise they will destroy rapport, alienate and project arrogance. The basketball steeple is one of the best examples of a class of body language signals (here specifically an illustrator) known as alpha-beta hybrids. Alpha-beta hybrids are the nonverbal equivalents of "having one's cake and eating it too". Knowing when and being able to dial down the alpha emotions a bit or fine-tuning the beta body language - is paramount in projecting leadership and confidence without alienating ... something few people can do. What other alpha-beta hybrid body language combos can you name? How many and how often do you use these? In dramatic distinction to the former President, Terry McAuliffe is not projecting confidence by picking his fingers and fingernails. This is an excessively beta, nervous and acquiescing body language. Even when standing next to a Head-of-State - no one should be doing this. McAuliffe knows better. This nonverbal display projects weakness, anxiety and insecurity. It in no way projects anything resembling strength, power or leadership. It also does not convey respect to the speaker. What simple maneuver would you advise to prevent this demure, self-touching faux pas? What undesirable nonverbals did the former President display in this video? Nonverbal Communication Analysis No. 2564: Hillary Clinton Stumping for Terry McAuliffe ... but Did She Hint at Running in 2016? Nonverbal Communication Analysis # 2360: Bill Clinton and the Body Language of a "Loose Hand, Palm Up Point"